In many cases, the most impressive feature of a room can go right over our heads. Literally. It’s easy to undervalue the impact of a beautiful ceiling, because it’s often easy to miss out on seeing them unless you’re in the habit of looking up as you enter a room. But in many cases, a ceiling is so well-designed, and fits in so perfectly with the appearance of the rest of the room, that the eye is naturally drawn upwards towards it. Here are a few that fall into that category. The basic structure of this space couldn’t be any more classically rustic, with its complex interwoven supports of unfinished wood. That’s why placing a giant disco ball right in the middle of it is so effective: the power of surprise. Many older homes, or homes built in an old-fashioned style, will have ceiling roses such as this one in all their rooms. In most cases, the light fitting will hang from its centre. 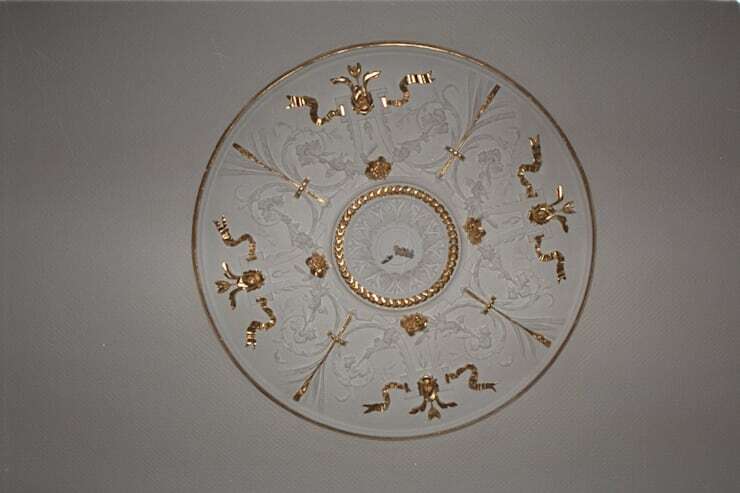 More often than not ceiling roses will be unpainted, but you can easily personalise them by picking out your favourite details using a delicate brush and metallic paint, as seen here. You might want to try matching your choice of paint to the main colour used in your lights. If your house is more modern, or has had many of its original features eradicated, it’s possible to buy a ceiling rose from most DIY or home improvement stores. The usual order of things appears inverted in this hallway, with windows found at the bottom of the wall and the ceiling finished in wood very similar to the floorboards. The floor has been highly polished, but apart from that, either direction could be up or down. The unusual shape of this corridor creates much-needed extra space; if it was kept to the width of the floor, it would be quite a claustrophobic passage. Wall and ceiling seem to merge, and it’s hard to define where one ends and the other begins. 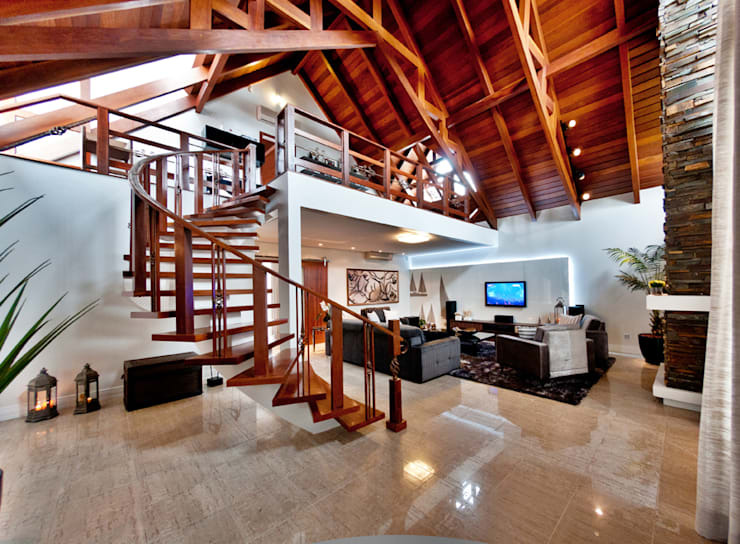 This beautifully crafted ceiling is grand enough to capture the attention of even the most design-challenged of visitors, but the mezzanine floor and the lovely staircase curving gracefully up to meet it also help ensure that one’s attention is immediately led up the way upon entering this space. The beams deviate from a typically rustic structure in a few important ways. Firstly, they leave space for large skylights which flood the room below with light. Secondly, some of the beams follow a zig-zag pattern that would more commonly be found in beams or supports made of metal. 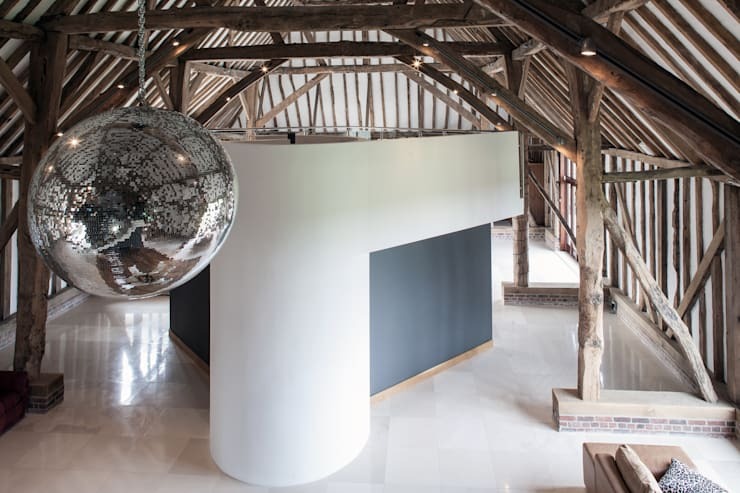 This slightly industrial edge is perfect for the house, which appears to be extremely modern in every way, with only the exposed roof beams providing a nod to tradition. 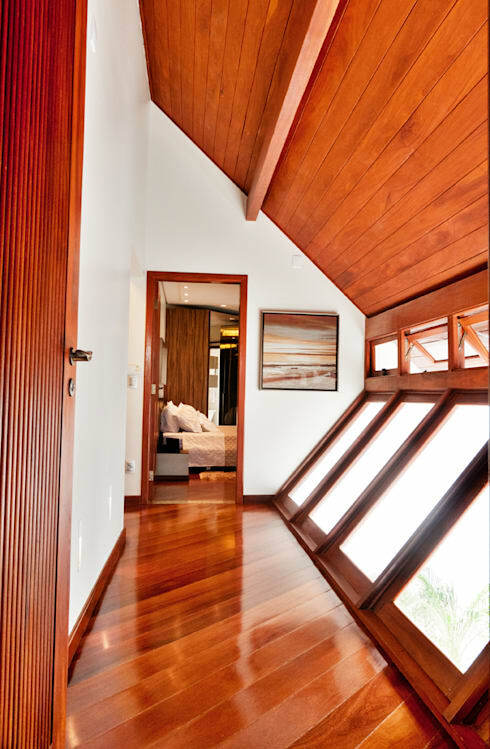 Skylights are often thought of as second-best to windows, for use mostly in attic spaces where they’re the only option. 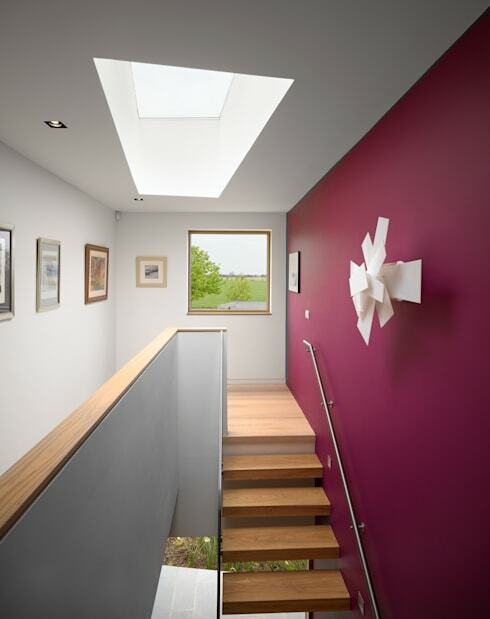 In fact the truth is that skylights can brilliantly almost everywhere, even in spaces where they’re not remotely necessary, like in the landing seen in this image. The extra light from the skylight further enhances the airiness of a space that is already bright and modern, while its presence also adds interest to the architecture of the building. 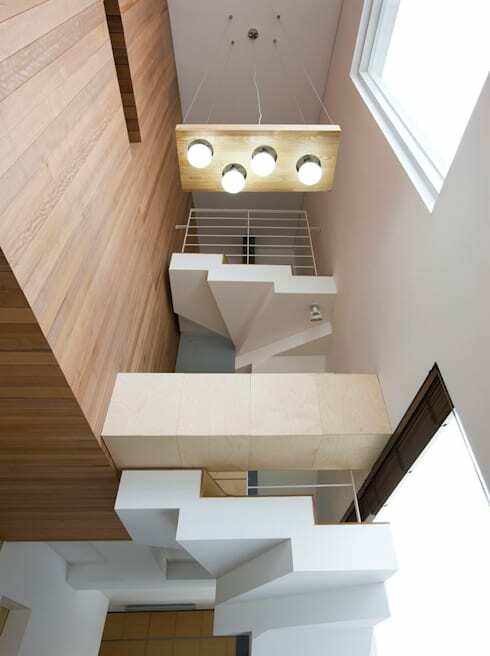 This upside-down staircase might not serve much of a purpose as far as getting from A to B is concerned, but it does look very striking positioned over its more functional counterpart. Looking up in this space, you are treated to not one, but a whole range of different ceilings that all work in harmony to create a quirky pattern. How do you feel about exposed beams? Do you have them in your home?